I’m completely brand new to fritzing and I am trying to convert my circuit wizard circuit into a breadboard one on fritzing. Attached is a picture of my circuit. Just build it on a BB and copy what you see. How would I make the NOR gates? Sorry I didn’t know you were at that level. In the drawing there is 4 of those gates, but if you look at the # they are all IC9’s, but with a letter. That tells you it’s 1 IC, but the insides are split into it 4. The gates even have the IC pin #'s. The part you want is 4001B. You actually want the 4001 multipart part in core parts. Typing 4001 in to the parts search (top right window) should bring it up. If it doesn’t appear then you need to do a parts update. The 4013 and 4026 don’t exist so you will need to create them using a generic IC and changing the pin labels. The diagram as shown is incomplete, the unused input pins on the 4013 need to be tied to either power or ground as CMOS ICs dislike floating inputs. The chips also need vcc and ground connections which are missing. You can find the pin numbers in the associated data sheet (there is likely a second flip flop in the 4013 which needs its input pins dealt with) Then you need to recreate the schematic in Fritzing by dragging parts in from core parts. Once you have done that completely then you can move on to placing the parts in breadboard view and using the rats nest lines (which come from the connections in schematic) to wire the circuit correctly. 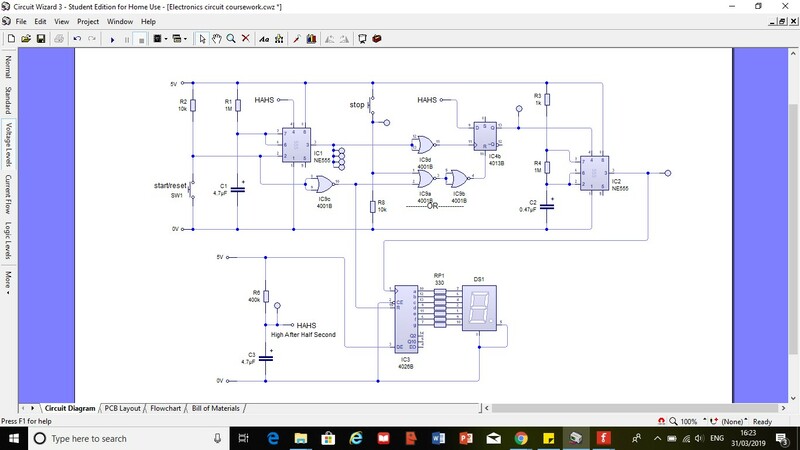 Take a backup copy of the sketch (the .fzz file) after completing schematic but before doing anything in breadboard because making mistakes in breadboard can corrupt the sketch. Hi, the 4001 does not appear when I type it up, how would I go about creating it? in to /path-to-fritzing/fritzing-parts (C:\fritzing\fritzing.0.9.3b.64.pc\fritzing-parts in my case). After that you need to start fritzing and from a view other than welcome click Part->regenerate parts database which will work for a while and then close fritzing. On restarting fritzing you should have the current parts including the 4001.